Random fact – She is a crazy Barbie Doll collector. Rachy, one of our advanced Pole instructor. Rachel has been pole dancing for about 6 years and instructing at AerialFit for 5 years and still has some very special students that were with her for her very first class teaching. Rachel instructs many classes each week but also trains the other instructors at AerialFit. Rachel started Pole because she could not find the motivation to exercise at the gym or on her own. She fell in love after her first class. When Rachel was young she dabbled in different activities like gymnastics, drama, hip hop dance etc…. Nothing lasted longer than a year. 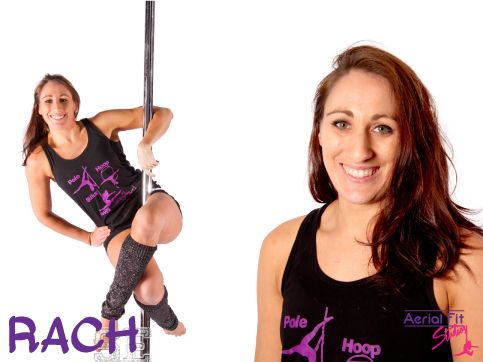 Rachel loves teaching and helping people to achieve their pole goals. If you have ever been to one of her classes they are lots fun, there are lots of laughs but still hard work at the same time. She is a fully qualified personal trainer and she also pole-danced while she was pregnant and has studied pre and post natal exercise. Rachel is also a fully qualified fashion designer and spends lots of time designing and making sports/pole wear. She has a cute brand that is known in the pole industry as Rarr.